Experimental tank. Developed by the Tsyganov group from 1936 through 1938. The vehicle underwent field trials, but never saw service. 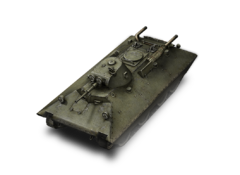 It was available on the Russian Portal in the Russian Gift Box edition as well as in a special Gift Box edition along with the MTLS-1G14, Pz.Kpfw. II Ausf. J and SU-85I. The enclosed code was valid for use on the RU, EU, NA and SEA servers. This tank, with regards to the high speed, well-sloped armor, this is arguably one of the most fun tanks in the whole game. Thanks to the rocket-like speed, ramming targets as a last resort is a possibility, though it is probably not recommended as you won't survive. One of the ways this tank is best played is to do a drive-by on a group of enemies, using your combination of excellent speed and sloped armor to survive as you throw shots downrange. Another viable option is to use your speed to get to good positions, allowing you to claim an area before the other team has a chance. The gun itself isn't too bad either, even if it is under par in some areas like depression. While it may have incredible acceleration and top speed, it comes at a price; its turning speed is abysmal. This means you should think ahead so you don't find your tank plummeting off a cliff or straight into another tank. The BT tanks were "convertible tanks". This was a feature designed by J. Walter Christie to reduce wear of the unreliable tank tracks of the 1930s. In about thirty minutes the crew could remove the tracks and engage a chain drive to the rearmost road wheel on each side, allowing the tank to travel at very high speeds on roads. In wheeled mode the tank was steered by pivoting the front road wheels. However, Soviet tank forces soon found the convertible option of little practical use in a country with few paved roads, and it consumed space and added needless complexity and weight. The feature was dropped from later Soviet designs. Christie, a race car mechanic and driver from New Jersey, had tried unsuccessfully to convince the U.S. Army Ordnance Bureau to adopt his Christie tank design. In 1930, Soviet agents at Amtorg, ostensibly a Soviet trade organization, used their New York political contacts to persuade U.S. military and civilian officials to provide plans and specifications of the Christie tank to the Soviet Union. At least two of Christie's M1931 tanks (without turrets) were later purchased in the United States and sent to the Soviet Union under false documentation in which they were described as "agricultural tractors." Both tanks were successfully delivered to the Kharkov Komintern Locomotive Plant (KhPZ). The original Christie tanks were designated fast tanks by the Soviets, abbreviated BT (later referred to as BT-1). Based both on them and on previously obtained plans, three unarmed BT-2 prototypes were completed in October 1931 and mass production began in 1932. Most BT-2s were equipped with a 37 mm gun and a machine gun, but shortages of 37 mm guns led to some early examples being fitted with three machine guns. 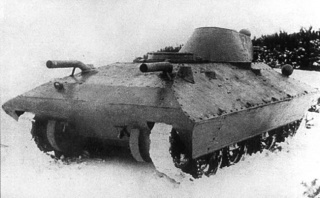 The sloping front hull (glacis plate) armor design of the Christie M1931 prototype was retained in later Soviet tank hull designs, later adopted for side armor as well. The most important legacy of the BT tank was the T-34 medium tank, arguably the most important tank of World War II. In 1937, a new design team was formed at the KhPZ to create the next generation of BT tanks. Initially, the chief designer was Mikhail Koshkin and, after his death, Morozov. The team built two prototypes. The light one was called the A-20. The more heavily armed and armoured BT derivative, the A-32, was a "universal tank" to replace all the T-26 infantry tank, BT cavalry tanks, and the T-28 medium tanks. 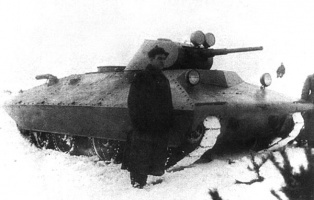 Such a plan was controversial, but concerns about tank performance under the threat of German blitzkrieg led to the approval for production of a still more heavily armoured version, the T-34 medium tank. Along the way, an important technical development was the BT-IS and BT-SW-2 testbed vehicles, concentrating on sloped armour. This proof-of-concept led directly to the armour layout of the T-34. This page was last modified on 3 January 2017, at 09:44.